To Massimo Maccagnola, Sales Manager Technical Support of Omipa Extrusion Machinery, what made the latest edition of CHINAPLAS stand out is that he has met with many more potential customers than in the past editions. The quality level of show visitors has obviously escalated, while buyers are increasingly concerned about the quality than the price of the products. Mr Maccagnola pointed out that in a niche market, it normally takes three to four months after the exhibition to see the results. Some customers may not get in touch after a long discussion at the fair but suddenly place orders after a few months. He also found that customers in China have been placing more emphasis on quality. “What I feel increasingly is the demand for quality. Four years ago, people at exhibitions were looking for more standard applications. If they found foreign products expensive, they would look for similar suppliers in local market. Now, people who came to the booth were more concerned about quality, which is getting more and more important to them,” he said. 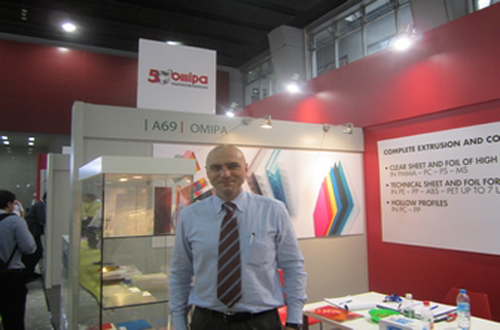 “Omipa is knowledgeable about new project development, we give very fast service to customers, and good quality,” he added.